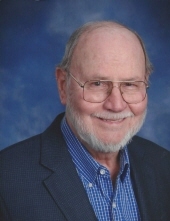 David (Dave) Leroy Collins was born October 21, 1934 and passed away peacefully on Friday, September 28, 2018 in Cypress, Texas after a battle with cancer. He was preceded in death by his parents, Jefferson and Mary Collins; and wife, Joan Collins. He is survived by his daughters, Barbara Albert and husband Paul; Michele Fisher and husband Barry; Julie Collins; granddaughters, Lindsey Derr and Leah Derr. He grew up in Panama City, Panama then moved in 1950 to Northeast Texas. Dave joined the Army in 1954 and served until 1957 in the Korean War where he was stationed in P’anmunjom, South Korea. In 1958, he moved to Houston, Texas and attended the University of Houston. David joined Exxon in 1961 and spent his entire career there, retiring in 1993. He lived in the Historic Houston Heights from the mid-1970s to the late 1990s before moving to West Houston. He was a faithful Episcopalian. He loved deer hunting, duck hunting playing ping pong and was an avid tennis player, winning numerous trophies. He also took up dirt bike riding for a few years after his retirement. The Collins Family would like to send out a very gracious thank you to all the caregivers who cared for David Collins in his time of need. They are profoundly grateful to each and every one. Dave will be remembered at Houston National Cemetery during a closed memorial service. Those wishing to make a donation in his memory may do so to the American Cancer Society. To send flowers or a remembrance gift to the family of David Leroy Collins, please visit our Tribute Store. "Email Address" would like to share the life celebration of David Leroy Collins. Click on the "link" to go to share a favorite memory or leave a condolence message for the family.